The next in our recipe series is a sushi roll that is very healthy and simple to prepare. It differs from maki sushi in that it is requires no cutting and is rolled by hand. Over the next few months, we’ll be showing you how to make the tastiest and most popular dishes out there. 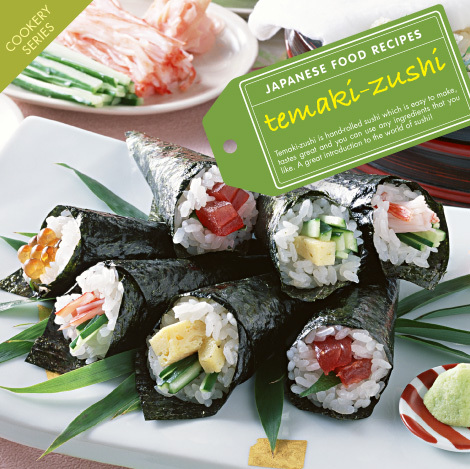 Temaki-zushi is hand-rolled sushi which is easy to make, tastes great and you can use any ingredients that you like. A great introduction to the world of sushi! • Tuna – Tinned variety mixed with mayonnaise. • Optional Ingredients: Mayonnaise, White or Black Sesame Seeds, Wasabi, Pickled Ginger, Soy Sauce. 1. After cooking 250g of rice, mix with 15ml (1 tbsp) of sushi vinegar and leave to cool before using. 2. Prepare the ingredients into thin 10cm lengths and cut the sheets of Nori seaweed into 4 square pieces. 3. Place one of the squares of Nori seaweed in your dry hands. 4. Add a thin layer of rice on one half of the Nori. 5. If you want you can add some sesame seeds to the rice for extra flavour. 6. Start adding any ingredients diagonally on top of the rice. You can use any combination, but fish and vegetables often compliment each other well. 7. Roll the Nori into a cone with your hands. 8. Your Temaki-Zushi is now ready to eat, enjoy! Posted in Food and tagged recipe, Recipes, sushi, temaki. Bookmark the permalink.